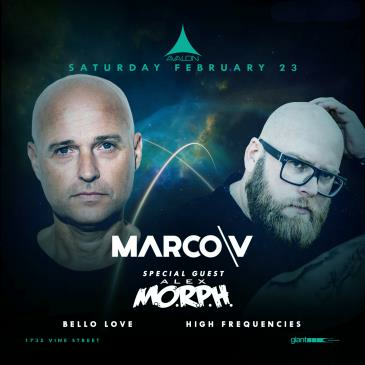 AVALON Hollywood is stoked to be welcome Dutch electronic virtuoso Marco V on Saturday, February 23rd, to be joined by special guest Alex M.O.R.P.H. Recognized as the architect of tech-trance, Marco V has proven himself time and time again as one of the most innovative and creative music minds in the industry today. Making a name for himself right of the bat with his first release of his remix of Energy 52 Classic and widely known for one of his first released singles “Simulated,” he continues to conquer the world’s dance music scene. Supporting Marco V as a special guest will be none other than the German “F3F” artist, Alex M.O.R.P.H. With Marco V having just released his latest single “Vortex,” on January 7th and Alex M.O.R.P.H. releasing his latest album, Moonrise, on January 18th, these two are on fire and won’t be ones to miss. Get your tickets now!